With small delay we are proud to announce 1.5.0 release of "Bind Mi Band" application that includes history of steps. This feature was internally tested more than month and last UI tweaks were done just yesterday, but now we believe that it is ready to be shipped to everyone. History displaying has two modes: chart and list. Feel free to choose which one you like more. 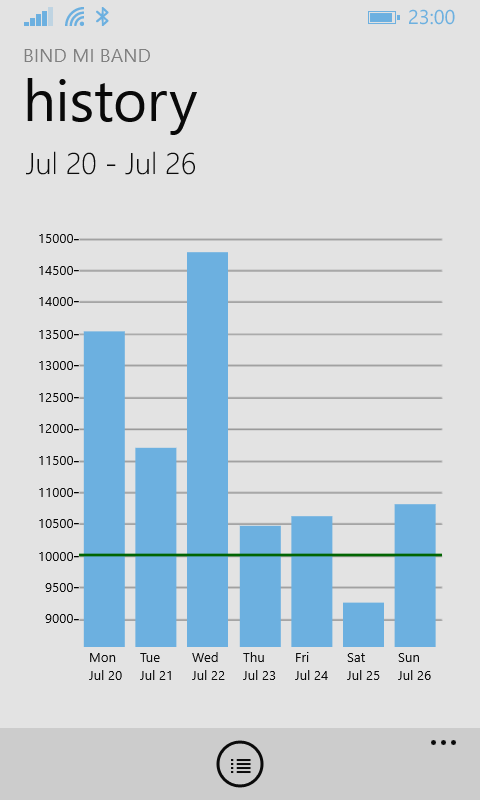 In chart mode a green line shows your current daily goal, so you can see if you reached it. 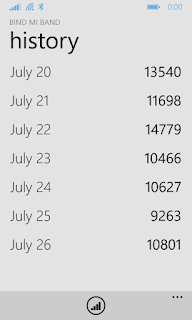 Your steps history needs to be synchronized at least one time per several days. Out tests showed that Mi Band can save up to 6 days of data, but there are no official guaranties. 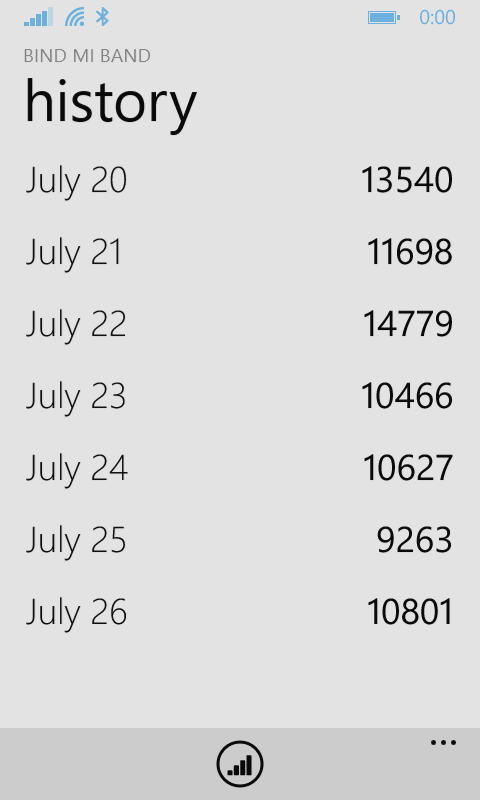 Also, remember, that synchronization of Mi Band with other device or app will clear all the saved data from it. - detailed daily history view, where you can see your different activities like walking, running sleeping, etc. 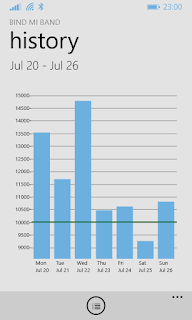 Thank you all for patience and start tracking your activity! The crashing issue is fixed in version 1.5.0.8, so make sure that you have updated to it. 1. Yes. I pair / unpair several times. 2. Samsung Ativ S with official 8.1.1. When i try to enter in step history, the App crash and close. I pair and unpair the band, but the problem not solve. I see that: the band seems conected but the quick access to bluetooth is closed... and is blocked. I confirm the problem by running history. When you try to run the application closes and the phone jumps back into the system. Otherwise, thank you for your work, the application is great. Thank you. Thanks!!! 1.5.0.8 Works perfectly!!! Fast dev!!! Really good app!!! Version 1.5.0. - history did not work. Updated to 1.5.0.8., could not even pair phone and band. Tried several times including phone reset. Lumia 630 dual SIM. Also, I confirm that 1.5.0.8 does the trick. Well done, I say, well done indeed! Ян, we mean regular vanilla restart, not factory restore :) I don't think anyone is actually crazy enough to wipe the phone just to revive a single app. Sorry if I sound very critical but no other option! I received the band as gift and with no calories and sleep tracking - it wasn't much useful, and among the options available in windows marketplace ( I chose Windows over Android long back - no regrets ever) - this one looked like a decent one. So i went for a paid version. the steps tracking is decent. The sleep tracking is almost useless for me. It assumes I fall asleep within 3-4 minutes after getting into bed. Grossly incorrect assumption! Even awakening count isn't very accurate. The other night, I got up at around 3 to go to bathroom - and the next morning i see it shows my sleep tracking as if I slept at 3 AM! For a person who lies in bed awake for a long time before falling asleep, measuring the sleep quality and actual sleeping time sounds like a crucial thing and very reason to wear a Fitness band whole time. But that purpose is not solved. I expected more smartness. Though Not sure if its the limitation of the band or the App. and the major problem i have is - every time i open app and sync data - after closing App, my Bluetooth goes crazy. the Bluetooth setting shows as if its been Off, but on button to put it ON is disabled. Many times my whole phone goes into a limbo status where except for call nothing works. so I need to restart the mobile. That is a major block and must be fixed! Regarding your last described issue: disable Live Tile feature. It's experimental and doesn't work good on Windows Phone. Thank you very much - nice work! Hi, what about Call notifications? Did you try this way? Probably, that will be next thing to do after localization, which I'm finishing these days. I think it can be expected in end of September or in October. Yes, I'm going to make improvements on sleep tracking. good day, it would be possible to change the input method for height and weight? Slider are quite inaccurate and Nokia Lumia 530 I have problems to hit the correct value. Perhaps it would be better used to specify the value or write a list such as the award date. Thanks for your work and look forward to future innovations. does it work with mi band 2 also?